Memos to Mom: Anthony Minghella, R.I.P. Sad and surprising news today from London. Anthony Minghella, 54, died today after a fatal hemmorage following surgery to remove cancer to his tonsils. The New York Times report here. He won an Oscar for his direction of The English Patient. He also directed Cold Mountain and The Talented Mr. Ripley. Here's an interview from Salon.com with Michael Ondaatje, author of The English Patient, from 1996 about working with Minghella. "His films deal with extreme aloneness and the redemptive power of love, even at the moment of death. I will remember him as a man who always wanted to get to the heart of the matter." A romantic in an unromantic age, one who believed there was a heart in the matter. 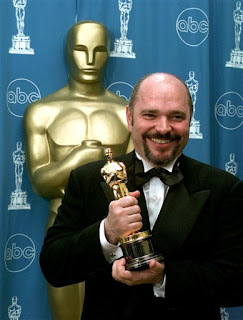 A true artist, the talented Mr. Minghella will be sorely missed.